At Autumn Ridge Farm, LLC we take pride in our well-maintained, professionally managed facilities. Our stable, an English shedrow, was completed in 2001. It has eight 12'x12' box stalls. Four of these stalls have small paddocks attached. There is also a 12'x16' foaling stall with a paddock. All of the stalls are matted with 3/4 inch rubber mats and bedded with pine or softwood shavings. Each stall has a Dutch door and a rear door or window. This allows the horses more freedom to look out of their stalls and see their neighbors and their surroundings. The stable is well ventilated, since all the stalls face fresh air, rather than a barn wall. Cupolas keep fresh air circulating in each wing of the shedrow. Our tack room is insulated and heated and is equipped with a refrigerator. A wash rack with hot and cold water provides a convenient place to bathe your horse and electric outlets located near each stall provide power for clipping and other grooming needs. The run-in sheds at Autumn Ridge Farm are sturdily constructed of the same materials as our main stable. Our fields are fenced and cross fenced with oak board fencing. All of our fences are sturdy and in good repair. You may never want to haul your horse again. Since Autumn Ridge Farm is located in a rural community, you can ride from the stable to miles of riding trails. Many of these trails are located on Autumn Ridge property and on neighboring farms and are exclusively used by our boarders and lesson students. The trails offer a variety of riding experiences, from walks through shady woods, to stream crossings, to canters through grassy meadows. Riders from a variety of disciplines enjoy our professionally built riding arena. At 100'x200' it is suitable for jumping, dressage, pole bending, trail courses, group riding lessons, and many other activities. 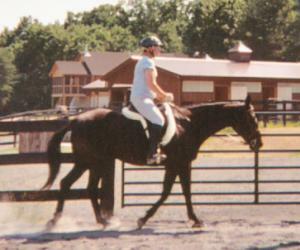 The arena is brightly lit and is equipped with jumps, dressage letters and cones, pole bending poles, and barrels. We also have natural obstacles as part of our trail system. We are a small stable with plenty of riding options so our arena is rarely crowded. 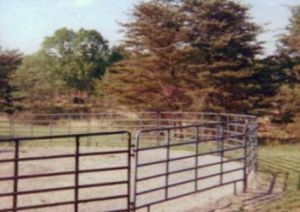 Our 60' round pen provides a safe area for longeing and long lining and for working with young horses. It is also a safe site for beginning riders to have their first lessons. Autumn Ridge Farm provides ample free parking for trailers and other vehicles. There is plenty of room to turn around in the trailer parking area. The Autumn Ridge boarders' lounge is large enough to accommodate seminars and meetings. It is comfortably furnished and includes a bathroom with a shower.